A few years ago, there was a rainstorm on my way to the 5th Ave. Coffee Company in Naples, FL—just enough of a downpour to make the final mile of my journey mildly irritating. As I pulled into a premium parking space, the weather cleared, offering a hint of cool October breezes mixed with wisps of warm sun rays. I met Roger and Lamar, and the three of us sat down for early morning coffee as we’ve done nearly every weekday for the past ten years. We were usually the first to arrive and this day was no exception, and there were plenty of seats outside lining the edges of the shop. I’d been thinking often and aloud about my station in life. As we waxed philanthropic over politics, people and our lasting legacies, a neatly dressed couple took the table next to us, joined by their teenage son. He looked to be about 16 years old and caught my line of vision because his physical appearance—dark eyes and hair— reminded me of my son Joe. Yet this boy was different. He gazed at the ground relentlessly, in seeming wonderment, an amused and angelic smile embossed on his strikingly handsome face. While most kids had their eyes lasered into the latest smart device, this boy found wonderment somewhere deep within himself—as if he and the Universe shared secrets only known to them. I was riveted—absolutely convinced I was about as close to divine intervention as I’d ever come, watching an interplay of spirituality, emotion and intelligence—unabashed joy mingling with a blindness to convention. There was something very special about this young man. I felt an immediate and overwhelming maternal compulsion to love and protect him. I fought for my common sense, remaining seated, boring and polite. He didn’t respond, except to gently push her hand away, but kept smiling, looking down—and then he met eyes with me. I was amused and had to speak. “Is he your son?” I asked. “He has the most beautiful eyes,” I said. I was truthful. His eyes were sparkling and brilliant, like rare chocolate diamonds. There was life in him. Magic. Without warning, Michael got up from his seat, walked over to our table and proceeded to bless me with a warm and unsolicited hug. “Michael!” His parents both yelled. “He’s not bothering me,” I said, lightly laughing—and it was true. Michael was still bent over hugging me, his smiling sweet face buried in my shoulder and his arms wrapped around my neck. “He’s autistic,” explained his mom. They got up, removed his arms from me and led him back to his seat. Michael made my day because he was doing his best—and it brought out the best in me. I think I smiled almost all day long. I left the coffee shop that morning but Michael never left me. I never saw him again, but often wondered about him and how he was doing. Michael inspires me because he doesn’t allow life to become stale and stagnant. He embraces his curiosity and people he likes without apology. He is simply happy in the moment and on some level realizes that every single day is a gift. It’s so easy to focus on what is wrong in your life, yet Michael reminds me to focus on what is good—the “who” or “what” which makes me smile or keeps us wide-eyed and hugging. He chooses to see a beautiful life from the inside out and it’s a gift I will always cherish. 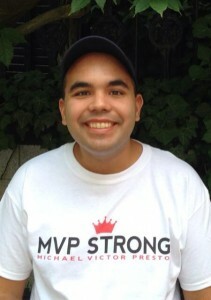 Recover, Michael, for you are MVP Strong —a lot of people out here are rooting for you! As for me—I’m going to take your hug and pass it on.